This is easily the best lawnmower I have ever owned! It has all the traditional advantages of being a convertible bagging mower/mulching mower. I can pick up the clippings and use them for compost, I can use it to pick up the leaves on the yard, or I can be lazy and just mulch everything! But, of course, the key benefit is the electric motor. I’ve owned this mower for almost three years now and have never had to do a thing in the way of maintenance. No oil, no lubrication, no filters, nothing. I never have to worry about whether or not it will start, there’s no priming, there’s no spilling gasoline on the grass when you run out in the middle of the job. You just plug it in and go. I’ve heard other people complain about the “difficulty” of dragging a cord around with you, but this is really no big deal. You quickly get used to it, and if you set yourself up so that you’re always moving away from the side of the yard where your cord is plugged in you never have to worry about crossing the cord. And if all the money you save from not having to buy gasoline and oil isn’t enough, you can feel good about being “green”! We all know gasoline powered lawnmowers belch smoke like crazy. The only emissions associated with this mower are what a state-of-the-art power plant has to emit to produce a few watts of electricity! - Electric motor provides reliable instant on/off operation, with none of the hassles of pull-starting gas engine motors. - The mulching feature eliminates the need to use the included rear-bag and having to dispose of grass clippings. - Need to purchase an electrical cord sufficiently long to cover the length of your yard. - Must be careful to avoid severing the electrical cord by rolling over it with the mower - plan your cutting pattern ahead of time. I've owned this mower for over six trouble-free years and normally using it about once per week except during the winter season. This is a lightweight and easy to maneuver push-mower powered by a corded electric motor. The mower uses "dead man" switch which immediately stops the motor when it is released. The switch is designed so that it is nearly impossible to switch the motor on by accident. A strain relief tab is provided to prevent the electrical cord plug from becoming loose. The mowing height is selected by squeezing the adjustment system to easily move the mower up or down on all four wheels at once. There is a reference scale to keep track of the height as well as to indicate the optimum height for mulching. The body of the mower is made of rugged plastic, which resists damage and also eliminates corrosion. Six years of use have resulted in little wear and tear. The electric motor just hums along. I've never had problems getting it started, in contrast to my old gas-powered mower. The noise is significantly less, which my neighbors appreciate. I have owned this mower for approximately three years and quite simply love it. When my wife said she wanted to try an electric mower, because she's afraid of the gas engine (and because she has a lower tolerance for tall grass than I), I was skeptical. But after getting used to working around the cord, I have to admit that the entire mowing experience is more pleasurable. The mower is much quieter than a gas mower, and lighter too. It sounds like a small dust vac. It requires no mixing of gas and oil, and is a zero-maintenance machine. We just have the blade sharpened once a year and it keeps cutting like new. I was also not sold on Black and Decker. It seems that they're reputation has suffered in recent years, and I've had a few small appliances that didn't last as long as perhaps they should have. But lawnmowers they seem to do quite well. We've never had an ounce of trouble with our Lawn Hog and we have a pretty large lawn to mow. Also exceptional is the attached mulching bag. We have a compost bin in our back yard and we just have to stop to empty the bag a few times during a mowing session to keep our compost brewing. 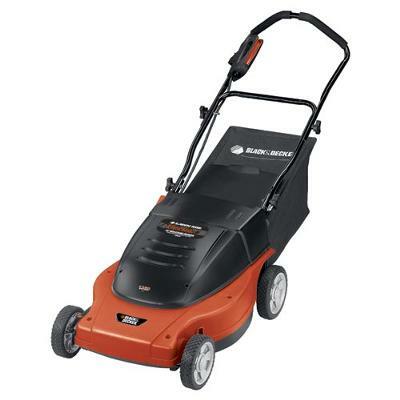 The Black and Decker MM875 is a great mower. It is super easy to adjust the mowing height and to attach/detach the mulching bag. Start up is as easy as plugging it in and pulling the handle. And I also take some comfort in knowing that I'm not polluting the air while I'm prettying up my lawn. I highly recommend this lawn mower. Prior to owning this mower, I've had 4 others. They've all been gas powered, so going with an electric mower was a big deal for me. Yes, this mower is electric. Not cordless (battery) but electric, with a cord. Buying this electric mower 4 years ago ended up being an excellent choice. Electric is good because I don't need gas. My blower and weed trimmer are also electric, which is great because I don't have any smelly gasoline in the garage. Electric is bad because of the cord. The cord makes it difficult to go around trees. Also, you need to be careful not to run over the cord. I've never run it over, but I just can't imagine it would be good. BUT, corded mowers are better than battery powered mowers because they have more power, and will cut through thicker grass. The mower has a switch on the handle- you need to keep this switch held in for the mower to run. This is easy to do...much easier than starting a gas mower. And the fact that it goes on and off instantly, makes it easier to move around the yard. But you still have the cord to contend with. Well, you just get used to it. When my wife or daughter mow the lawn, (which is very rare unfortunately!) they have a real tough time with the cord, it constantly gets in their way. I've mowed the yard often enough that I know how to deal with it. I've changed my pattern, and I know how to keep it out of the way. In the tradeoff between cord annoyances, and having a battery wear out, I would choose the cord every time. I bought this mower at Orchard Supply Hardware for about $250. I've been happy with it for 4 years, and I would buy it again.